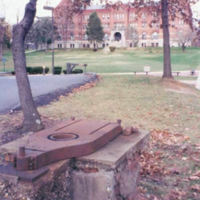 All that remains of the astronomical observatory that stood on Killon Field north of Caldwell Hall is a low brick foundation with a metal mount. 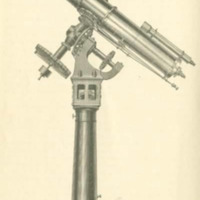 A few traces of the Observatory, its equipment, and the activities that took place inside it can be gleaned from University publications of the time. Erected in 1890, the Observatory stood on the highest point of the campus and exactly on the 77th meridian from Greenwich. Its dome was fifteen feet in diameter and was constructed by Warner & Swasey of Cleveland, Ohio. It was equipped with an equatorially-mounted telescope with a nine inch aperture. 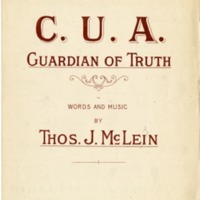 The 1892 annual report of the rector notes that comets a,d, and f were observed twenty-five times for position, and the findings were recorded and published. Extensive calculations were made on f, known as the Holmes comet, and it was believed that the periodicity of its orbit was first discovered at Catholic University. In 1895 an anonymous benefactor presented a meridian circle valued at $1,200 to the Observatory through Father Searle, C.S. P., professor of higher mathematics and director of the Observatory. By 1910 the Observatory was also equipped with a sidereal clock, a chronograph, and a chronometer. Courses in general and practical astronomy and orbit computation taught by Mr. Doolittle were offered that year. Special practical work could also be arranged with Mr. Doolittle, who was listed as the University's only faculty member of the department of astronomy until 1921. The Observatory was destroyed by a fire on October 31, 1924.